My original title for this post was “Vexed” but I’m trying not to have a negative overview of things, it’s just not good for me. The bunnies I’ve been crocheting with wool were cute pre-felting… not so cute after… (pictures coming soon). Fleshing out ideas directly on [short supply of] nice fabric…not such a great idea. I hate the thought of making things over again though … but I keep holding onto the illusion that as I make a new project it will come out perfect the first time. Yeah, I’ll have pictures of these soon,too. 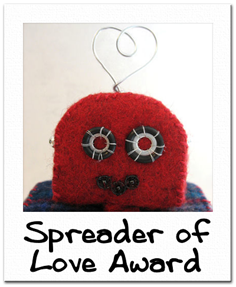 I received a “Spreader of Love” award from the Rings & Things blog. Dave, on Twitter was one of the first to show me how people really listen out there! When I announced a new blog post at twitter, he posted a lovely comment & I truly appreciate it. And… on twitter he connects to the most interesting links and information that are truly unique. Link to the Design Gallery for the pen project is here (not affiliated,just think it’s really great). A link back to “rules” are no longer available at takung.blogspot.com. Thank you! I made that robot such a long time ago, thought it was perfect. Good thing the rules said 5 recipients, would have loved to give more! Oh Tammy! *hugz* Thank you soo much for the “Spreader of Love” award! This is such a nice way to spread love around. Love the idea! I love your robot! Have a lovely merry happy day and lots of love to you! Wow, thank you Tammy!! I, too, have never received an award before. You just made my morning. And now? I shall go spread the love. 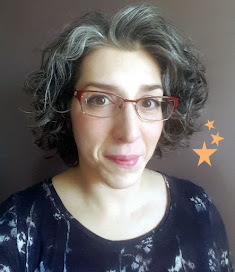 To steal a phrase from another cool blogger, it sounds like you have material for a few posts on "what I learned" by trying to do something... :) Keep up the good work Tammy! Your robot is so cute!